For most people, working from home sounds like a dream. You get to work the hours you want, wear what you want, and don’t have a boss looking over your shoulder. This can make home-based business owners and employees a lot more productive, but only if you have a home office that’s designed with efficiency and productivity in mind. If you’re planning your home office, here are six elements you need for health, happiness, and productivity. When you work from home, most of your work is going to be completed on a computer, which means you have to ensure that yours is suitable for your needs. You don’t necessarily need the latest or most expensive device, but it should be customized to the work you do. Consider whether a laptop or desktop is most suitable, and get all of the software and hardware you need. When you are trying to get a lot done each day, the last thing you need is a slow internet connection. This will slow you don’t, disrupt your focus, and completely ruin your productivity. Because of this, you should ensure that you do your research and find a provider that is fast and reliable enough to handle your workload and all of the devices you need to use each day. The light in your office can affect your mood, as well as your ability to see, which means you must ensure that it’s as good as it can be. Take a look at a few different light fittings, like the ones at sunpan.com, and choose one that lights up your entire room. You can add other fittings and lamps too. You should also try to fill your workspace with as much natural light as you can. You might aim to be as paperless as possible, but there are always going to be a few documents that you need to have in hard copy. Because of this, it’s important that you have an organized and easy to understand filing system to store them in. This way, when you need to find a document later on, you’ll be able to do so with very little trouble. One of the benefits of working from home is that you can pop into the kitchen and get a drink or snack anytime you want. Unfortunately, if you do this several times a day, chances are, you’re going to get distracted at some point and waste precious time. To avoid this, you should keep drinks and snacks in your office, and only leave to use the bathroom or go on a break. When you work from home, there are a number of distractions you have to face each day. These include your pets, your children, your partner, housework, and much more. It’s important that you have a way to block these distractions out and focus solely on your work. A door is the best option, but, if it isn’t possible to have a room to yourself, then set up some other kind of barrier. Working from home can boost productivity levels, but only if your office is efficient. 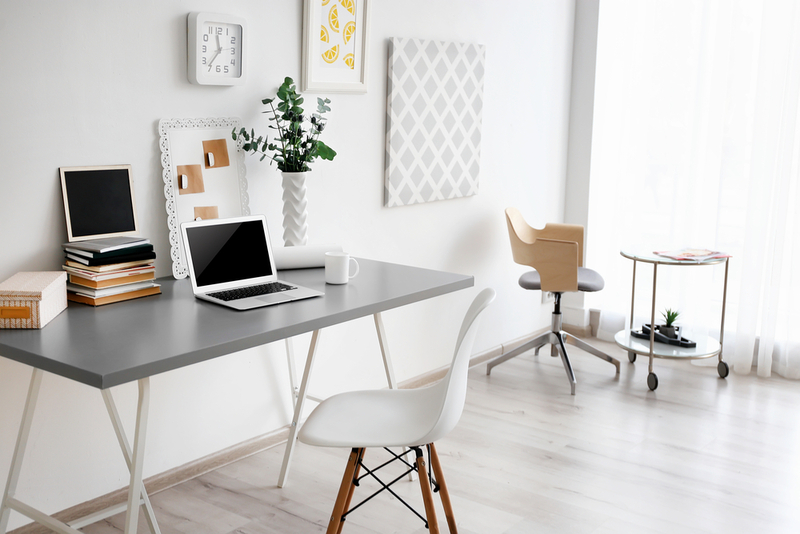 When planning your home office, make sure you remember the must-haves listed above.